Flaws in Oracle Java, Adobe Flash Player and Adobe Reader, along with weaknesses in Microsoft Office, are the most popular targets for criminal exploits. Between March and August 2013, Kaspersky researchers registered 8.54 million attacks using Java exploits – an increase of 52.7 per cent on the previous six months. Kaspersky believes that the best way to address this rapidly evolving threat is through a dedicated technology that offers its own unique layer of protection against exploits aimed at vulnerabilities in popular applications. By preventing these malicious pieces of code from executing in the first place, it’s possible to prevent core enterprise applications and components from becoming gateways for larger scale attacks. Automatic Exploit Prevention significantly reduces the risk of infection from widespread malware, or more targeted attacks using exploits – even when a zero-day vulnerability is used. 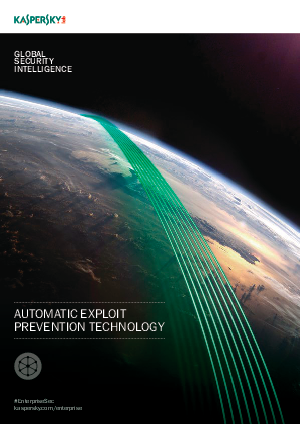 Download now to find how Automatic Exploit Prevention significantly reduces the risk of infection from widespread malware and targeted attacks.